“The Candy Shop” by Brandon McCormick is an allegorical film that presents the shockingly prevalent sexual trafficking of children that is currently plaguing Atlanta. 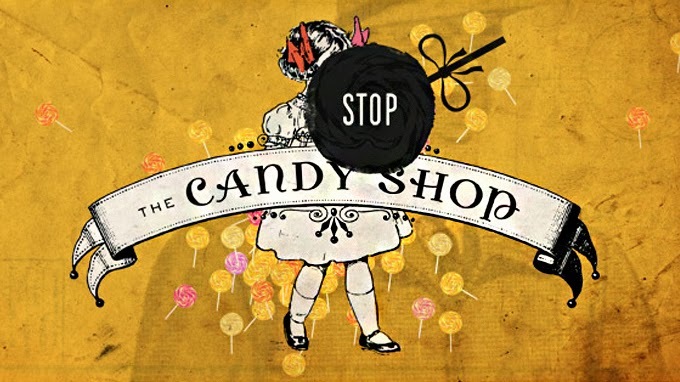 Description: The CSE/HT committee of the Junior League of Atlanta is excited to present the documentary, "Stop the Candy Shop" on Saturday, March 1, 2014 at the Atlanta Speech School, in the Love Auditorium, located at 3160 Northside Parkway NW. Doors will open at 10:30 a.m., with the film beginning at 11:00 a.m. and the panel discussion commencing at 11:30 a.m. The committee is partnering with Street Grace, a local organization that works to end commercial sexual exploitation(CSEC) of children through awareness, empowerment and engagement. Street Grace will lead the panel discussion after the viewing of the documentary, and give the audience action steps to help end CSEC! Breakfast will be served. Why Commercial Sexual Exploitation of Children? 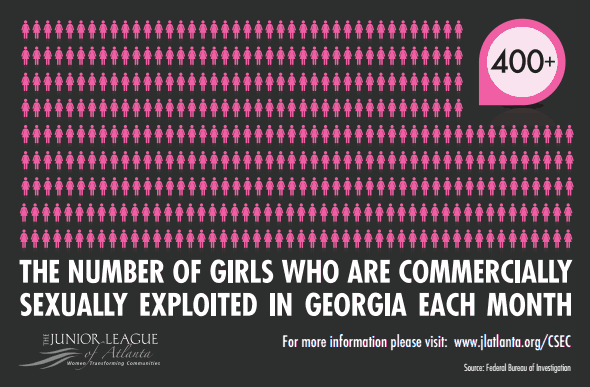 More adolescent girls in Georgia are harmed by prostitution each month than are killed in car accidents each year. Pimps can make as much as $624,000 a year through the sale of as few as four children. What is the JLA doing? The Junior League of Atlanta has been supporting and serving our community’s most vulnerable children for over 90 years. We are now focusing those efforts, resources and enthusiasm to solving this epidemic in our city. With a comprehensive effort involving all of our members – provisional to sustainer – we can make a difference in the lives of these children. We are conducting community training and advocacy workshops to better educate our members and the public on this issue and what they can do. In 2009, a Girls Roundtable was held with over 20 community voices discussing ways to prevent the exploitation of children and available resources. An Education and Empowerment workshop for adolescent girls is planned for April 2011 focusing on awareness and prevention. In November 2010, a Business Breakfast was held and over 30 business and community leaders learned the extent of this tragedy and its effects on business and the community. A more targeted business breakfast is being planned for April 2011. A billboard outreach campaign was launched in 2010 to provide victims with the Georgia Care Connection number, a resource line dedicated to helping them. The billboards also served as a way to let the pimps and johns know that the community will not be silent anymore. We are keeping track of upcoming legislation that we can support that would reduce demand or supply for commercially sexually exploited children. Through our efforts, we may be able to shape public policy to support the reduction of CSEC. The League’s Commercial Sexual Exploitation of Children (CSEC) committee is working on many ways to increase awareness of this issue, reduce the demand for exploiting children and reduce the supply of children at-risk to exploitation.